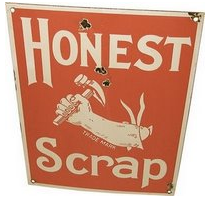 Thanks Danielle at Well, that's just fabulous for the Honest Scrap award! Thanks so much! You need to check out her blog and Blog Design site if you haven't already, by the way! 1) Choose a minimum of 7 blogs that you find brilliant in content or design. 2) Show the 7 winners names and links on your blog, and leave a comment informing them that they were prized with "Honest Scrap." Well, there's no prize, but they can keep the nifty icon. 3) List at least 10 honest things about yourself. 1. I'm obsessed with flossing. I floss after every meal. I have dental floss in my purse, my car, and my desk at school. 2. I've just recently (like 2 months ago) started watching Desperate Housewives (DVD's not the current episodes! )...a little behind I know. I've caught up through season 2 almost through Netflix. 3. 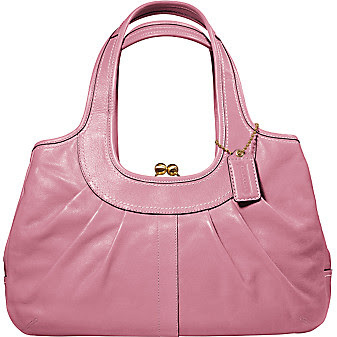 I'm currently slightly obsessed about buying one of these purses...tell me I shouldn't! 4. I have no savings:( Which is why I shouldn't do #3. 5. I am on a new diet, read about it here. 6. I wished I had my own house. I dream about it and decorate it in my head. I have a 'house' file folder with plans, furniture, paint chips, and fabric swatches. 8. I bite my nails/cuticles when I'm bored/nervous/watching tv. 9. I love to cook, plan parties, and entertain. 10. I am not a good pill/vitamin taker, I can't swallow them very well. I'll tag anyone out there who wants to play along. I find most blogs brilliant in content and design which is why I have a blogging addiction. I haven't done one of these in a long time - I'll join ya! 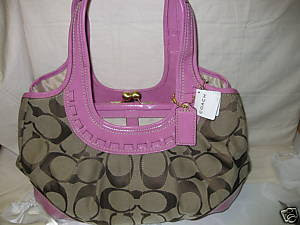 I love that Coach bag.